The Cathedral of the Blessed Sacrament, dedicated in June 1889 and rededicated on November 20, 2005 after a significant two-year restoration, serves as the official seat of the Diocese of Sacramento. As one of the largest cathedrals west of the Mississippi, it accomplishes the effective blending of glory and grace. Its architecture and interiors are described as a Victorian interpretation of French Renaissance. 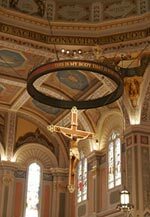 Within this beautiful church are many breathtaking features inspiring faith and sharing history, including the Cathedra (Bishop’s chair), a spectacular dome, a 13-foot crucifix, a tabernacle tower and a 100-year-old sanctuary lamp. The resplendent art, which encircles the dome and adorns the chapels, masterfully conveys Scripture and God’s saving grace. The beauty of the Cathedral also reflects God’s awesome beauty and instills in us a yearning to be caught up in the beauty and life of God. When we pray in the Cathedral and ponder the Divine Mysteries referred to in the artwork and design, we experience a foreshadowing of heaven, a foretaste of eternal union with God. Consequently, the Cathedral entails much more than what meets the eye. For the broader community, too, the Cathedral is a powerful symbol of God’s presence, and of the transcendent dimensions of life, as well as a reminder to attend to one’s spiritual hungers and needs.